Yesterday was ridiculously windy. 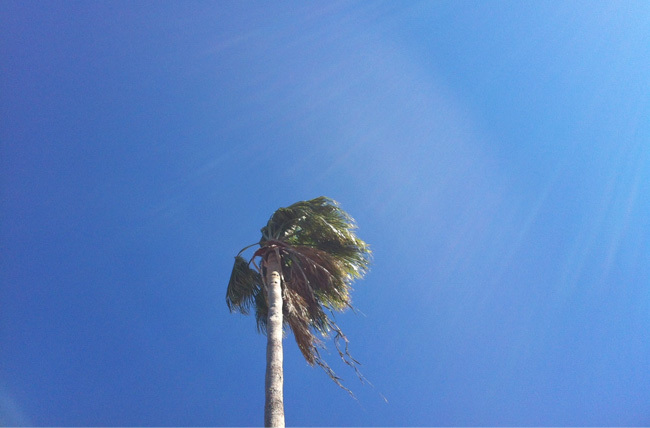 I mean, look what it did to that palm tree's hair! Pretty nonetheless, in my opinion. I'm soaking up the sunshine and the cool air in the office today while I finish up the floral painting. Even though I'm painting it in a "quick style," I find myself tiptoeing around it, afraid to add on each new layer. So far so good, though. Hopefully we can keep up this trend! I can't wait to see your new painting. I wish it were that sunny here! Unfortunately, it's back to bitter cold for us. But at least it's friday :) Looking forward to seeing your new painting! Coulda shoulda woulda: Ha! It does, doesn't it? Abby: Ooh, the biting kind. I know what you mean!! I used to live in the Panhandle, and the wind was so cold and strong that I would lose my breath when it hit me. Liz: So excited to show you!! Kyla: Yes! Thank goodness for the weekend. :) Have a great one!